A few days in Bangkok will most likely be part of any trip to Thailand. The hectic megacity can easily be overwhelming, so here’s a few recommendations to help you make the most of your time in Thailand’s capital. A popular gathering point for budget-minded backpackers, Khao San Road makes a lot of travelers’ destination lists for its supposed night life offerings. In reality, it’s kind of sketchy, with lots of hawkers eager to make a baht off unsuspecting tourists. Decide how much you value your organs before a night out at Khao San Road. If you still feel compelled to see what all the fuss over Khao San Road is about, after your inevitable disappointment, walk one street over to the much nicer and more laidback Rambuttri Alley, which is lined with a nice assortment of cafes, bars and restaurants that won’t make you feel like you’re risking your kidneys by entering them. Rambuttri Alley is a much more inviting evening out than Khao San Road. Popular scam: a driver tells you the destination you want to go to is closed, so instead he whisks you off to a canal tour. Yes, we got roped into this one. We were well aware we were being scammed, but I actually was interested in touring the canals. Turned out to be a major disappointment and a ripoff. If you want to do a canal tour, make sure you do the research ahead of time to pick a reputable provider at the right time of day. When we went, it was dead and boring. Don’t let a driver con you into it. The canal tour was terrible, but this lady made it a little more bearable by selling me an overpriced beer. If you just want to see what life on the river is like in Bangkok, opt for a water taxi instead. There are published routes that will help you navigate to major sites. From the BTS Skytrain, we took a water taxi upriver to the Grand Palace and Wat Pho area for only 30 baht (less than a dollar). Be advised that some docks have an “exit fee” of 20 baht, but for 50 baht total (~$1.50), you’ll get to experience the waterways without being fleeced like on the canal tours. Water taxis are a cheap way to get up and down the Chao Phraya river. I don’t even have a picture of an expensive restaurant to put here because we didn’t even bother, so here is a lavish bathroom instead. The street food scene in Bangkok is legendary, with no shortage of food stalls serving up delicious meals are bargain prices. You can easily fill up and have a drink for less than $5 per person. Our favorite meals in Thailand came from the streets. Sadly, city ordinances are endangering Bangkok’s street food scene, so best experience it while you can! Two people can easily share a gut-busting meal for under $10. It’ll probably be at the top of any guidebook’s list, and there are some truly incredible structures to behold at the Grand Palace—that is if you’re able to see them through the throngs of tourists that will be there. We’ve been to a lot of major attractions around the world and I’m not sure any have been as crowded as the Grand Palace. If you go, go early, before the busses show up, and pray you can get a good shot before it’s filled with thousands of tourists. The Grand Palace is the perfect destination if you want to push your way through a shoulder-to-shoulder crowd of people. There will likely be a decent-sized crowd here as well, but no where near the level of the Grand Palace. The key attraction here is the Reclining Buddha, the largest in Thailand. You’ll have to crane your neck to get a good pic, but it’s well worth it. After that head to the onsite massage therapy school to treat your aching muscles. I like big Buddhas and I cannot lie. Again, Bangkok is a city with more than 8 million inhabitants. There’s no shortage of things to keep you occupied. After you’ve checked off the main attractions, take part in some of the local city life. This solid-gold Buddha is a must see, but don’t limit yourself to just the standard list of attractions. Reclining seats seem to be a feature that’s slowly catching on at American theaters, but they don’t do it as well as Bangkok, which has numerous theaters offering recliner-only seating. We checked out the Paragon Cineplex where the seats came with a blanket and a 15-minute massage voucher. What’s better than a movie and a massage? As a bonus we also had access to an exclusive “lounge” before the movie that offered refreshments. Hopefully this list gives you the proper orientation to enjoy your time in Bangkok. Buckle up and be ready for anything. 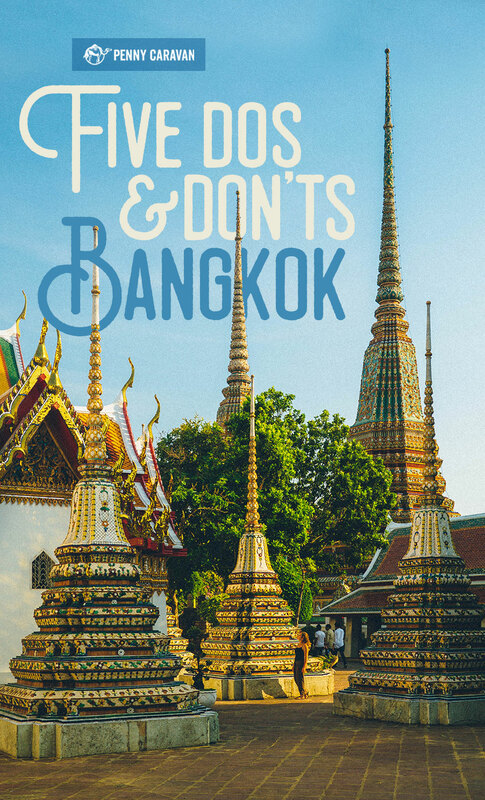 What are some of your Bangkok “Do”s and “Don’t”s? Post them in the comment section below! Like this post? Pin in!